This post is inspired by Messy Money's experience with schadenfreude. All languages are classed into language families. English's family is Germanic. English has one of the most extensive vocabularies of any language on Earth, but somehow German still has so many words for complex concepts that would take us almost an entire sentence to explain. Schadenfreude has already been covered, but let's look at these 8 words and examine how we could use them in our lives when we talk about money. Verschlimmbesserung- Something that was supposed to be an improvement, but actually made things worse. Use it in a sentence: I invested in US property in 2007. That was a total verschlimmbesserung to my portfolio. Torschlusspanik- Fear of time running out or opportunities slipping away. Use it in a sentence: The investors started dropping their shares as torschlusspanik set in. Fernweh- The urge to leave your familiar surroundings and be anywhere else. The need to discover new places. Use it in a sentence: Mia realized she had made a verschlimmbesserung when two weeks into her new job, she was feeling fernweh. Weltschmerz- What you want your reality to be like is not congruent with what it actually is, largely due to outside circumstances. Weltschmerz makes you melancholy and apathetic. Use it in a sentence: He was born into a poor family, and felt there was no way to become wealthy, causing him great weltschmerz. Vergangenheitsbewaeltigung- The struggle to come to terms with the past. Use it in a sentence: She could not get her budget under control because her vergangenheitsbewaeltigung kept her from thinking about the debt she had incurred. Kummerspeck- Excess weight gain from emotional eating. 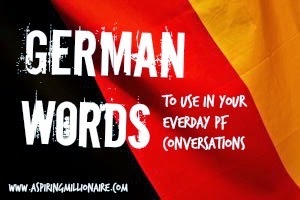 Use it in a sentence: Once she finally confronted her vergangenheitsbewaeltigung around her debt, she binge ate for days, causing her kummerspeck. Use it in a sentence: Every time she posted her budget for the month, there was a handschuhschneeballwerfer who criticized her spending down to the penny under the name "Anonymous." Do you have German experience and want to add more words to the list? Leave them in the comments! Ah cheers! I took German in highschool but I forget most of it. At the risk of sounding like a weirdo - I did spend some time transcribing documents from WW2 for family history research center and Holocaust memorial. Did you know that most were recorded in gothic script vs. roman. Very beautiful to look at but hard to read/ decipher. Some were very sad and I could only look at them in small batches. Thanks for the mention!